As a group of conservation minded waterfowlers we see the need to stand up, taking stewardship of local wetlands and waterways. Become a member or send us your ideas to build a better environment. Help conserve our local wetlands for future generations. Find out about upcoming events, socials, fundraisers, and most importantly Service Projects and Programs. We operate out of Harrisville, Utah and conduct the majority of our projects in Northern Utah. Currently we have on-going projects in Weber and Cache counties with future projects in Box Elder. We are a group of conservation minded member of the community. Who decided to stand up and take stewardship of our local wetlands. We focus on wetlands, waterfowl conservation and support other types of wildlife conservation. We engage with the community to teach our version of hands on conservation and promote adults to pass on the legacy. 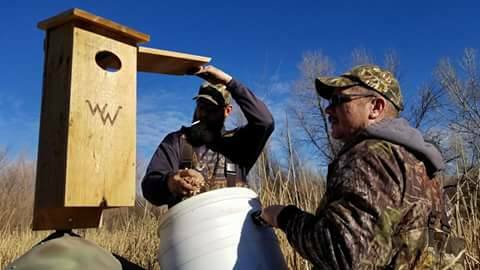 We have waterfowl artificial nest boxes for wood ducks, mallards and even geese in Ogden Bay, Ogden Nature Center, Kingfisher Wetlands and the Bear River Conservancy. We work with other organizations on projects from protecting the water flow into our wetlands to Phragmites control. Each year we hold a youth outdoors activity fair at Fort Buenaventura. This fair is free to the public and to potential vendors. Parking is also free, so come on out and get them kids interested in the great outdoors.